October is over and the typically volatile month saw a near 2% market sell off. 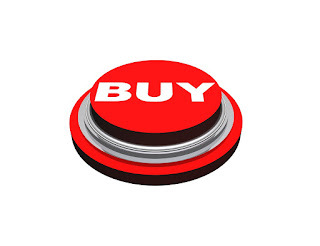 This has provided some great value in the way of high quality, dividend paying companies. Even though the S&P 500 is trading at a P/E of 24.29 there are plenty of great companies that should be considered 'on sale'. Putting money to work each month is very important. No matter the state of the market making purchases instead of timing the market has been proven to be better in the long run. This holds true more so when you start as early as I did! Many of my friends ask "Div Kid, when should I start investing?" and my answer is always the same. Yesterday. Starting your investing journey early is the best thing you can do for your future self. I always like to post my monthly purchases as it keeps me on track and keeps me accountable. Last month I put my advice into practice once again and made some of my largest single purchases ever. With that I added to two of my larger positions in an effort to build A. Bigger positions in two of my favorite stocks right now and B. Average down on some initial positions I had made a few months back. These purchases represent a total securities value of $2023.91 at the time of purchase. This is again one of my largest months in pure purchase value ever following only September! I love being able to deploy capital this way even when I don't currently have an income. With me being in college I love that I have decided to save more money than I spend. My ability to save when I do have an income allows me to make great purchases that will continue paying me back. 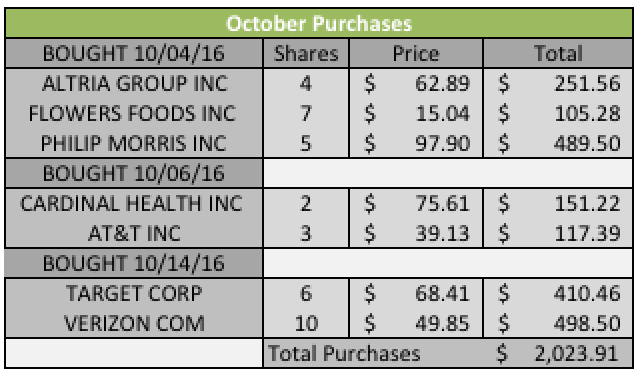 Looking at the companies I purchased in October I see many great names for current income. I don't typically make purchases based on what I think my portfolio needs, rather I try to buy what is on sale. Averaged across the number of shares for each purchase, the yield of these purchases comes to 4.14%! This is a 10.49% increase in average yield from last month and is at the upper limit of what I want to be buying right now. These purchases will add an additional $20.59 per quarter and all things being the same, $82.34 per year! I love seeing increases like this. It lets me know that I am taking the right steps in my journey! I look forward to more of the same in November! 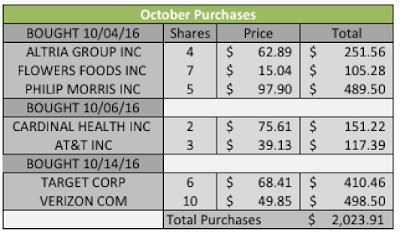 Did you add any of these companies in October? I am a 22 year old kid who seeks to create a life of financial independence via passive income. The accumulation and growth of quality dividend yielding stocks will be the main source of income and this is my journey. I am not a licensed investment advisor nor am I an investment advisor. This site should be viewed for educational and purposes only. I am not liable for any losses suffered by anyone reading this blog. Unless your investments are FDIC insured, they may decline in value. Please consult with an investment professional and/or tax professional before investing any of your money. Any transactions I publish are not recommendations to buy or sell any securities.